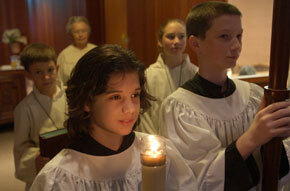 Children and youth serve the altar during Mass and other Holy Day celebrations. Boys and girls, 4th through 12th grade, are invited to take part in this ministry. We are always looking for new altar servers, so if you are interested, please contact Deacon Stacy Millsap at the parish office at (361)993-4053 or email deaconstacy@stpiusxcc.org. To be eligible for the Eucharistic Cross Bearer award, a server should have served for at least 3 years; must be at least in the 9th grade; must be a model of dedication to serving; must promise to serve all four years throughout high school; and must be approved by his/her pastor. Eucharistic Cross recipients wear a Eucharistic Cross attached to a red cord with red tassels. Eucharistic Cross recipients also received a red sash to be worn around the waist as a sign of their commitment to continue serving all the way through high school. The 2018 recipients of the Eucharistic Cross Bearer Award are: Ryan Lennan, Christian Ramos, Briana Rodriguez, Kyler Ross and Jonathon Shull. Servers who have served ten years received a Eucharistic Cross with a purple cord and tassels, along with a purple sash. The 2018 recipients of the Recognition for 10 Years of Service are: Emily Rodriguez, Amy Ayala, Mark Muenster & Benjamin Toren. One male and one female server who have given outstanding service over the past year were recognized with the presentation of special plaques designating them as this year’s Outstanding Servers for St. Pius X Parish. The 2018 Male Outstanding Server is Christian Ramos and the 2018 Female Outstanding Server is Amy Ayala. Congratulations to these young men and women, as well as to all of our Altar Servers and M.C.’s!